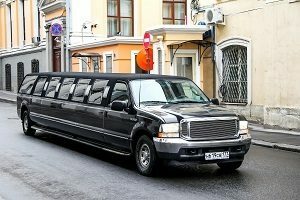 Enjoy the stylish and glamorous way of arriving at your destination with our one of a kind Ford Excursion limo, which is fully packed with originality and luxury. You can enjoy a trip to any location and share the comfort that this service offers with your friends and family members. 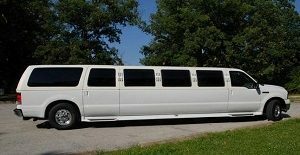 We offer the Excursion limo for hire – it can accommodate up to 16 people! Get rid of that dull and boring ride and replace it with a luxurious arrival at your destination with our well-known car service by choosing Fast Limo Hire. This famous selection comes in different colours which will surely provide your journey with lavishness and intricacy. It comes with state of the art facilities both video and audio with fibre optics incorporated into its mirrored ceilings which will surely jump start the beginning of a great night out. It comes with tinted windows so you get to enjoy your privacy. You will feel special and comfortable with its leather seats which will surely make your journey relaxing, comfortable and enjoyable. Enjoy the complimentary bar area packed with party drinks which are all chilled for you to enjoy. No additional or extra charge all of these car compliments which also include non alcoholic drinks such as soft drinks, juice and water. Select the supreme way of arriving at your party destination with our Excursion limo for hire. Call Fast Limo Hire now on 020 3006 2092 and organise the best night of your life.